Van Gogh had no formal art training and indeed had already embarked on several other careers giving each up in turn before turning to art. He had been an art dealer (working for a relative) before becoming a preacher before becoming ill, he took to painting during his recovery and was then determined to become an artist. His mental health was precarious and he suffered repeated bouts of maniac depression, psychotic episodes and delusions. These cumulated with him severing his ear and presenting it to a brothel worker and resulted in him spending just over a year in a mental hospital. These depressions and bouts of poor mental health lent him a frenetic energy which he poured into drawing and painting. The results of this frenetic energy can be seen in the mark making in his works and especially in his drawing which allowed him to work rapidly. Looking at Fig. 4-7. Starry Night (1889) we see an evening scene where all should be calm and settled but it’s not!, what we see is a scene bursting with energy and vitality. The sky which should be the calmest area in this work is like a sea in the middle of a storm, the moon glows from the top right and this light ripple in pulses of energy from this source meeting in turn other pulses of light from the stars. These stars and moons would look more at home as the flak trying to bring down an enemy plane. The Cypress tree is twisting and turning as it reaches upwards and these energetic branches look like the twisted spikes of a lance than the branches of a tree. The pastoral scene below all of this seems to surge left and right as it is filled with its own waves of energy from the hatching he uses to describe tone. The chimneys of the cottages trail smoke into the sky but these are not whimsical wisps of smoke they seem more like tornedos reaching down from the sky. 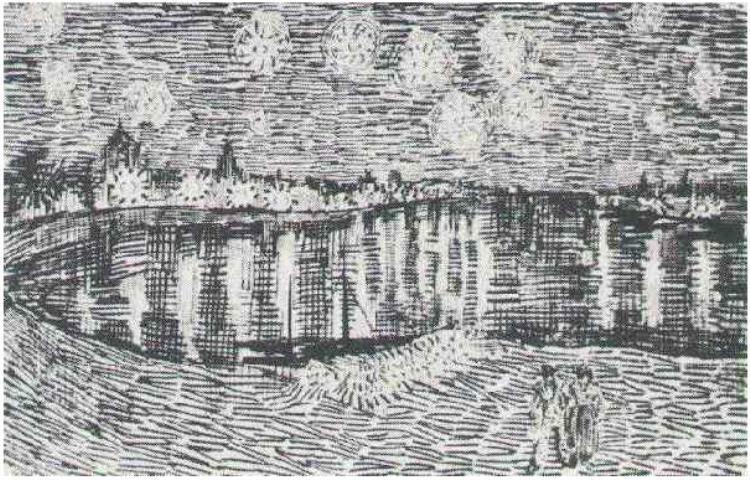 A year earlier Van Gogh also did a drawing also titled “Starry Night” Fig. 4-6, despite having many similar elements it does not have the manic energy of the version done the following year, possibly as his mental health was continuing to worsen. Looking at his paintings it is obvious that his drawings had a strong influence on the outcomes of these works. The linear element of his drawings with strong energetic marks is carried into his works in oil on canvas. Van Gogh was not afraid of experimentation. He had ample opportunity to study fine art works up close when working as an art dealer and later when he was determined to become an artist he practised incessantly. He noted in one of his many letters to his brother Theo: “For you mustn’t think that I’ve put watercolour or painting out of my mind. I certainly have it in mind, but drawing is the root of everything, and the time spent on that is actually all profit.” (Vangoghletters.org. 2018 :349). Everywhere Van Gogh went he took his drawing materials with him; he used a variety of easily portable materials such as pen and ink, pencil, chalk and the like. He also combined these different media in a single work using chalk for instance to heighten the work as he required. See Fig. 4-10 where he combines pencil and black chalk to create the moody dark buildings that even though set back seem to loom threateningly over the people in the square. The penwork of Van Gogh is an area which interests me greatly and which is in essence the subject of my critical review in this Drawing Course. Van Gogh uses reed pens along with quills and other basic ink drawing materials, but it is his mark making that catches the eye rather than the method of making them. The sources for drawings by Van Gogh seem numerous but there is an absence of specific sketchbooks, they all seem to be catalogued as individual drawings rather than as bundled as time specific sketchbooks. Despite this I was able to find two specific websites rich in his drawings. One of these is the Van Gogh Museum [VanGoghGallery.com. 2018]; and the other a book (available as a pdf) by the Met Museum. [Ives, Colta, 2005]. 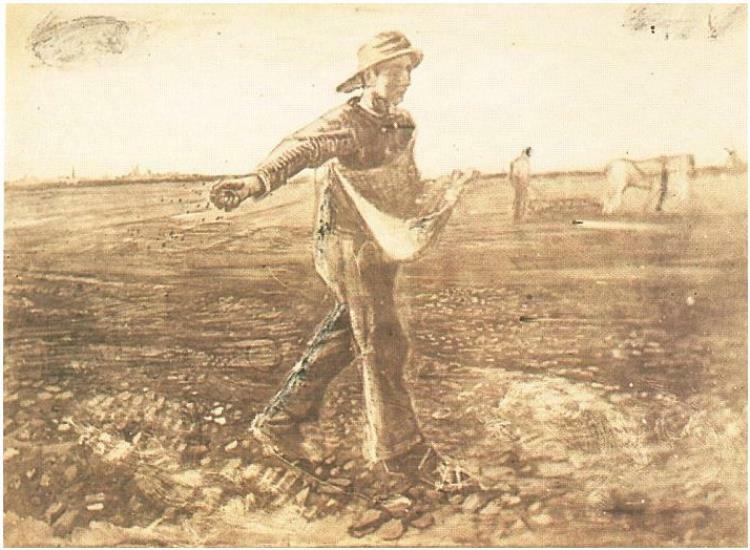 In addition to including two versions of “Starry Night” in the examples below I have also included four versions of the “Sower”. Peasants and pastoral scenes was a frequent theme for Van Gogh for several reasons. He was particularly drawn to the work of Millet and thought that these humble workers noble and more deserving than their current lot in life. In these four different versions set over a period of years the development of Van Gogh as an artist and his mark making can be traced. 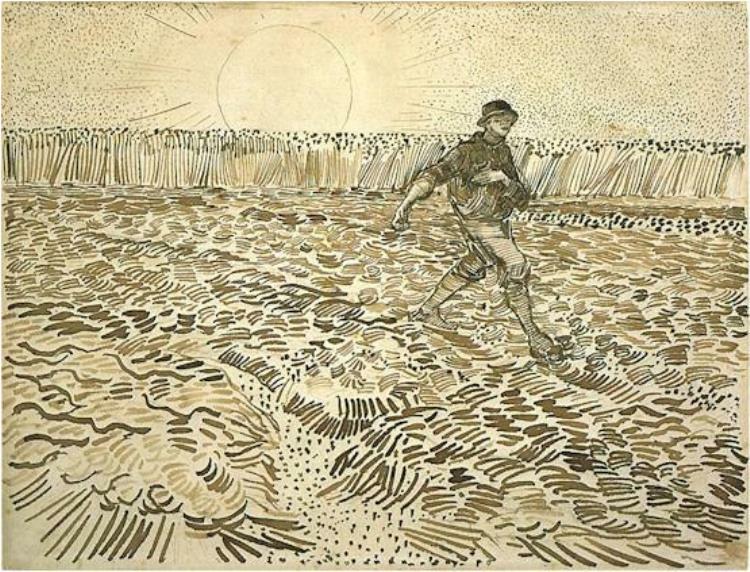 The early 1880’s see Van Gogh use full tone to describe the scene both peasant and surroundings, through the middle of the 18880’s he turns more to linear marks in the use of a pen and finally the late 1880’s see the pen marks imbibed with a frantic energy which brings them to life. Where previous he had described objects and people in his drawing his later work brought them to life. The marks in the work fully describe the texture of the rough ground, the coarse texture of the woollen clothing as well as the furrows and ridges of mud and the upright stalks of wheat. The sun bursts over the wheat field with the light emanating from it like a religious object. 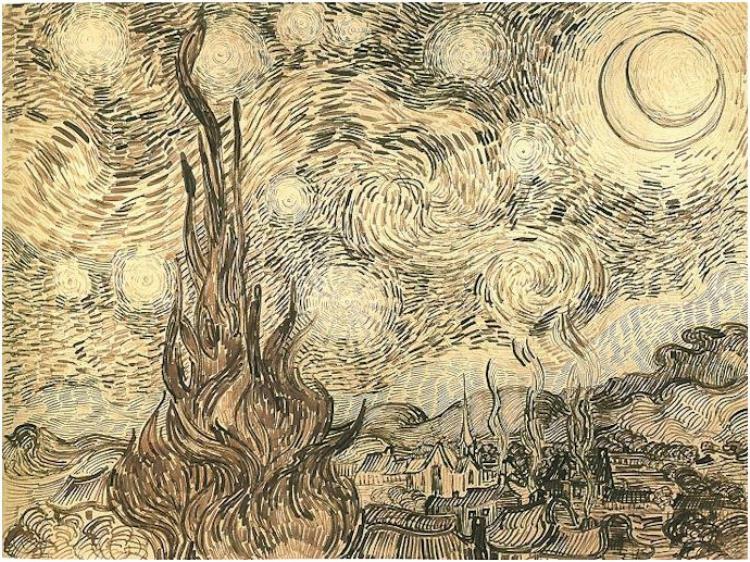 The sky is not empty as Van Gogh describes the atmosphere as he fills it with marks and stippling from end to end. 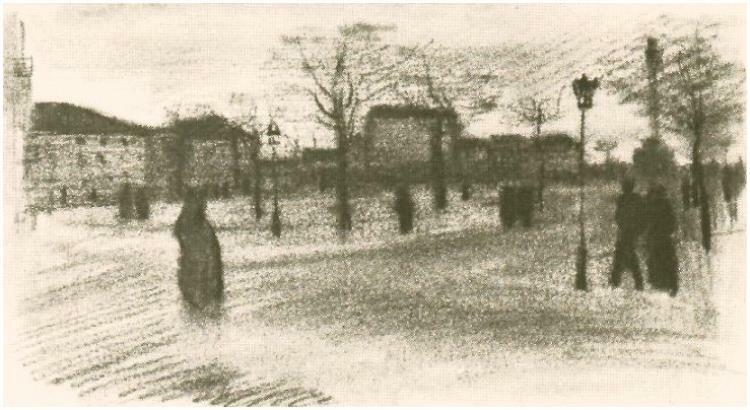 Other sketches by Van Gogh show that he was keen to draw people and places as life carried on all around him. 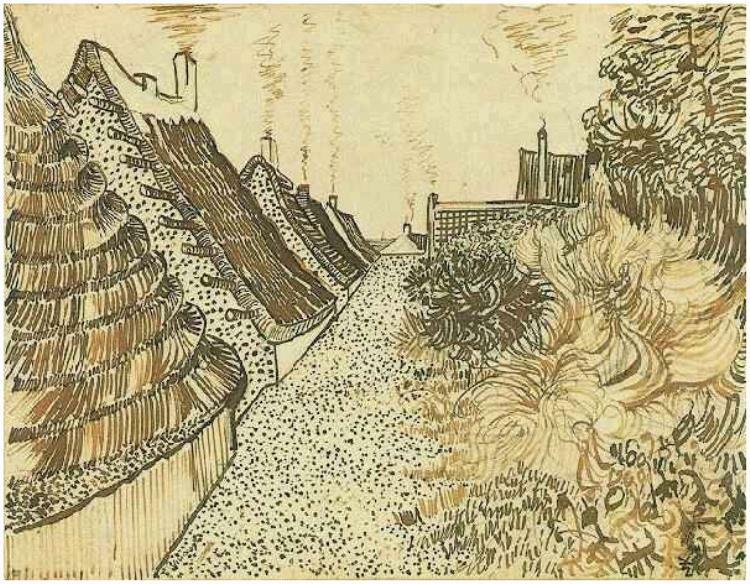 As well as drawing the peasantry of the countryside Van Gogh ventured into towns and cities drawing the buildings and setting all around him as he sought to describe in his sketches the rest of his world. 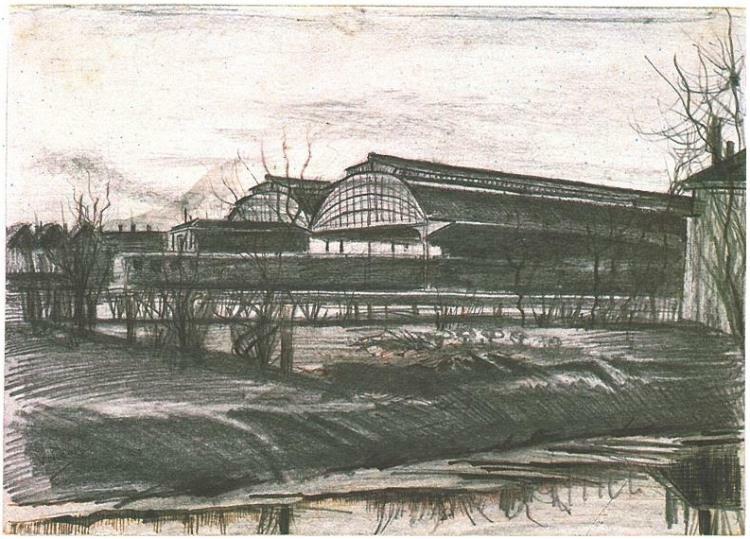 He uses pencil and pen to draw the dark shapes of the Staatspoor Station (1882) (Fig. 4-5) using the dark masses to give weight and presence to these structures, this does not yet exhibit the frantic energetic marks of his work a few years later. Fig.- 4-11. Street in Saintes-Marie drawn in 1888 does however have the characteristic marks. He seems to drop a series of bundled stripes and marks onto a page and then arrange then to depict the tiles of the cottages, the twists and swirls of the foliage and the earthen road as it recedes into the distance. 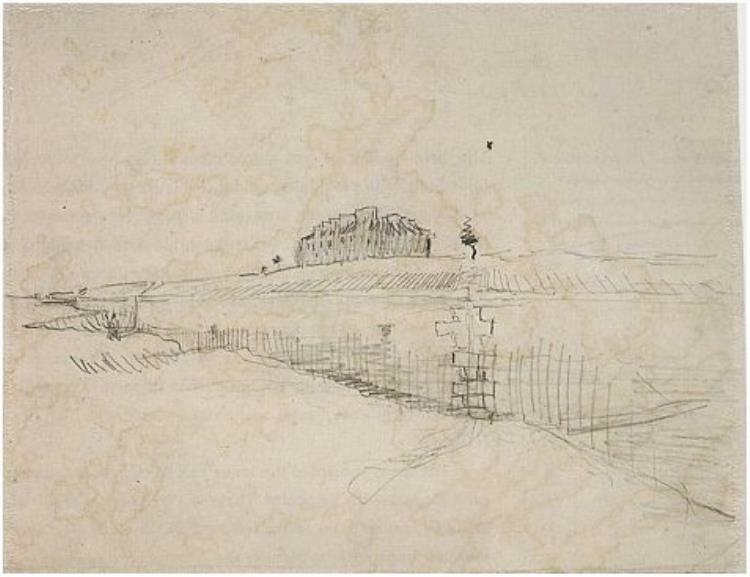 This drawing of the Street in Sainte-Marie is sharp contrast to the drawing of the Paris Ramparts which nearly seems unfinished as the page contains very few of the marks which he seems to fill drawings with from edge to edge, there is usually very little pure plain paper remaining from his later works. The simple Study of a Fruit Tree, Fig. 4-12 encapsulates the essence of his mark making in a small drawing which he properly did in a minute or two. The swirl of the upper foliage seems more like mountains than the wispy light branches of a tree. The ground is simply described with minimal line to denote the slope of the land and the shadow from the tree. The dark mass on the right cannot be mistaken as more trees he gives these simple outlines a mass and presence with heavy horizontal overlapping lines. 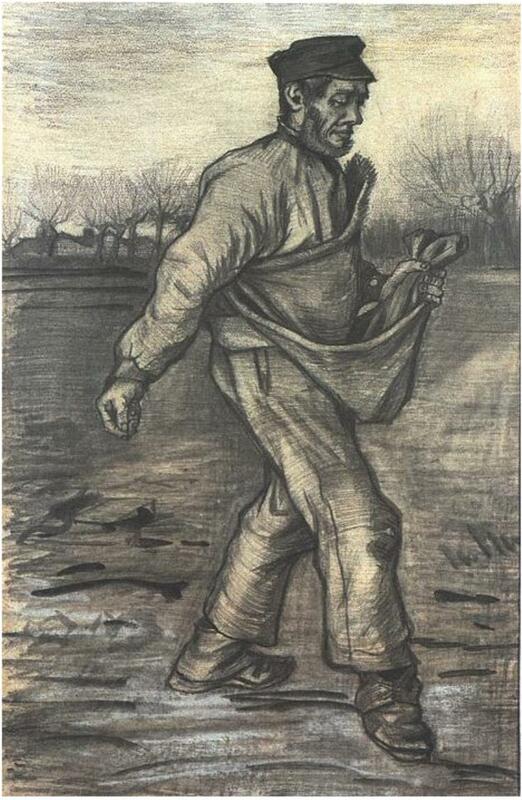 This drawing in ‘black chalk’ could easily have been done in his characteristic ink pen but Van Gogh uses this chalk to his advantage by smudging some of the lines to create tone and soften edges. Fig. 4-8., is a page from his sketchbook where Van Gogh depicts in a series of quick sketches people enjoying life, this was not a usual subject matter for him. 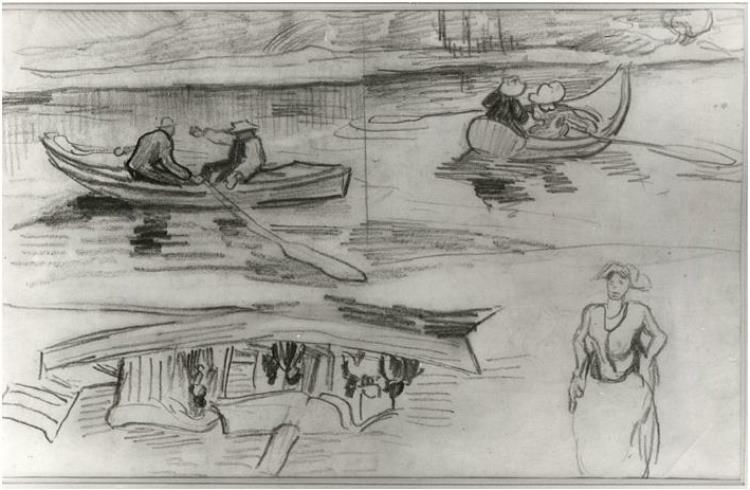 Here he gives us quick pencil studies of boaters on the lake as well as woman in traditional customer. Metmuseum.org. (2018). [online] Available at: https://www.metmuseum.org/toah/hd/gogh_d/hd_gogh_d.htm [Accessed 16 May 2018]. VanGoghGallery.com. (2018). Vincent van Gogh Gallery. [online] Vincent van Gogh Gallery. 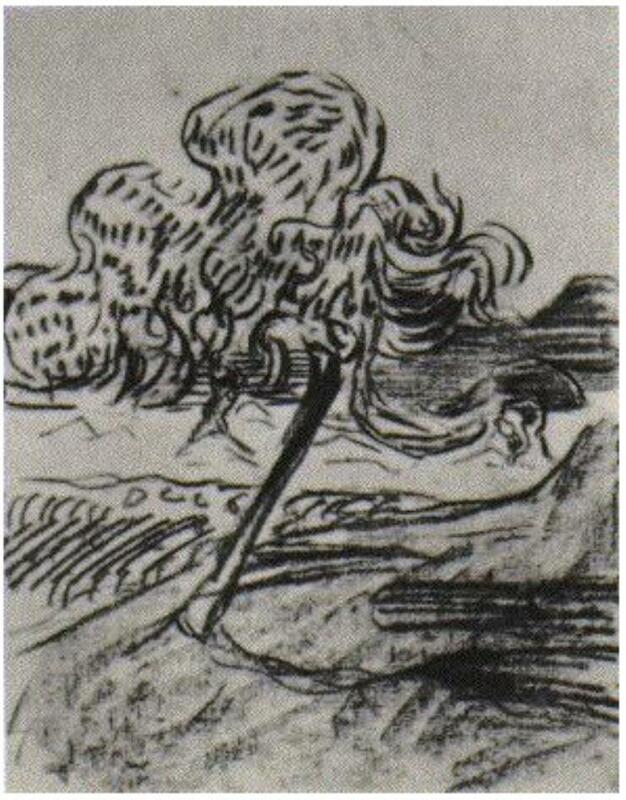 Available at: https://www.vangoghgallery.com/catalog/Drawing/ [Accessed 16 May 2018]. Vangoghletters.org. (2018). 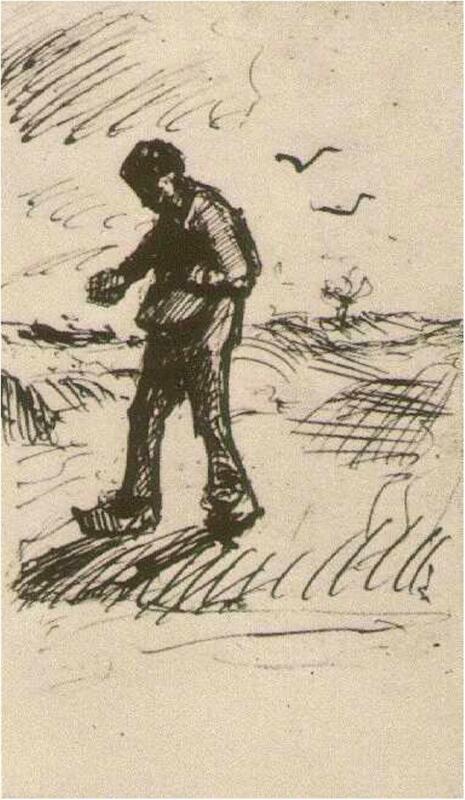 349 (351, 290): To Theo van Gogh. The Hague, Sunday, 3 June 1883. – Vincent van Gogh Letters. At: http://vangoghletters.org/vg/letters/let349/letter.html [Accessed 6 Feb 2018].